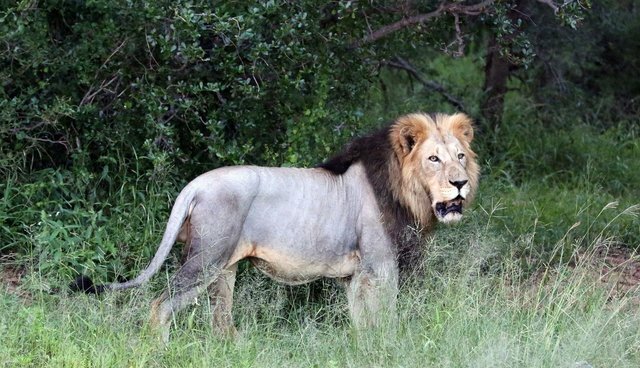 There was worldwide outrage when the public learned that Minnesota dentist Walter Palmer flew halfway across the world to southern Africa to lure a mighty beast out of a national park in Zimbabwe, and shoot him with an arrow - just to mount the lion's head in his living room and get a leg up on his competitors in the macabre universe of globe-trotting international trophy hunting. It turns out that Palmer's shameless act is not unique in the world of competitive trophy hunting, and that other wealthy elites travel just as far to shoot the king of beasts - but in hundreds of cases a year, it involves shooting lions in a corral or a pen, in a no-kill-no-pay arrangement. On Oct. 7, MSNBC airs a must-see documentary, "Blood Lions," that pulls the curtain back on the shockingly large, unregulated, and appalling South African captive lion hunting industry. Though much of the media following Cecil's death focused on illegal hunts, "Blood Lions" makes clear that South Africa's legal lion hunts are perhaps the most cruel and depraved of any. "Blood Lions" offers a rare glimpse into the captive, or canned, hunting industry, in which animals are bred in wretched conditions solely to be shot at in hunts with "guaranteed kills" in fenced areas where the animals have no opportunity to escape. If the US Fish and Wildlife Services lists African lions as endangered, the disgraceful import of these lion trophies by American hunters should stop, denying the industry a vital class of fee-paying patrons. The documentary follows a South African safari operator and an American hunter as they expose this sordid industry. The so-called "hunters" who frequent these operations quickly dissolve the myth that this is a sport - they are there solely to gun down the animals and collect their trophies in a transaction where the kill is certain. One trophy hunter interviewed in the documentary says he prefers to kill captive lions because their dead bodies are not as scarred as those of wild lions. At The Humane Society of the United States, we've been fighting the captive hunting industry for decades. We always hear the same excuse from the defenders of this mercenary trade - that captive hunting somehow aids conservation in the wild or supports local communities. "Blood Lions" ably shatters these self-serving myths, demonstrating that the industry hurts wild lion populations and does nothing for local communities - enriching the operators of these facilities and enabling American trophy hunters who have a mania for head-hunting, regardless of the circumstances of their alleged "hunts." We recently released a new report, "Trophy Madness," which provides a broad view into the bloodlust and vanity that fuels wealthy individuals to hopscotch around the world to kill endangered and penned-up animals. We found that one Michigan trophy hunter, the owner of a large mechanical contracting firm, has killed animals of more than 250 species in 26 countries. He once even sued his African hunting guide for not getting him enough trophies to add to his "significant" collection and for not getting adequate video footage of him killing animals. We also found that a trophy-hunting couple from NY, who made their fortune in real estate, have killed nearly 600 majestic wild animals. They sued the US government after it tried to stop them from importing the body of a rare sheep they had killed in Pakistan. Behind so much of this trophy madness is one group: Safari Club International, the world's largest club for wealthy trophy hunters. The Safari Club is notorious for encouraging hunters to kill the rarest animals in the world by offering prizes and awards. The "Grand Slam Cats of the World" requires a hunter to kill four species of wild cat, for example, and the World Hunting Award requires a hunter to kill hundreds of animals. The African Big Five Grand Slam requires a hunter to kill a lion, an elephant, a rhino, a leopard, and a Cape buffalo. The Safari Club is now gearing up for its annual awards gala, to be held at the Mandalay Bay Resort and Casino in Las Vegas next February, with a thousand exhibitors offering guided trophy hunting excursions to kill a dizzying array of the most beautiful and often imperiled animals in the world. It's going to require a sustained public outcry to shake this club of wealthy trophy hunting fatcats out of their moral blindness. "Blood Lions" is a critical step toward creating that outcry. I hope you'll join me in watching it on MSNBC, at 10 p.m. ET tomorrow night.